Hello guys, I am back again with a new review post for you. 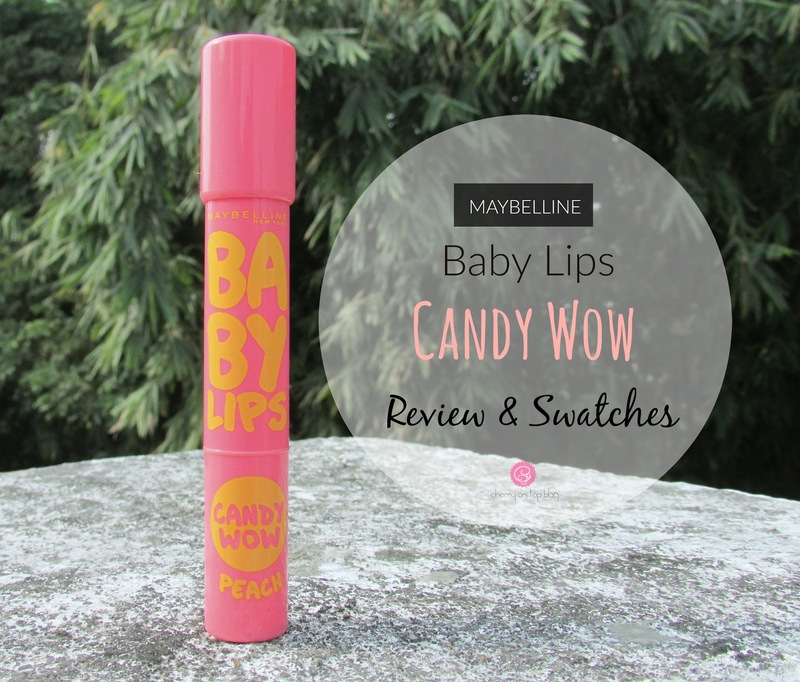 Today I will be reviewing the new Maybelline Baby Lips Candy Wow lip balm sticks that they launched recently. Maybelline Baby Lips lip balms have been my absolute favourites since they came to the Indian market. I have always beena fan of their cute packaging, fruity smell and great texture. So, when I was approached for reviewing this new launch I was really excited. Guys, let’s not waste your time anymore and let’s get straight in to the review. Packaging- The Maybelline Baby Lips Candy Wow lip balms are housed in a cute, plastic twist up packaging. It’s somewhat similar to the classic Baby Lips packaging but it has been given a chubby stick/lip crayons style packaging which I found is really cute, cool and offbeat. The packaging is sturdy and travel friendly. Every shade variant comes with a different packaging in terms of colour. The one I received came in a bright, peach coloured packaging doing complete justice to the shade of the balm inside. Shade- Maybelline has launched 5 shades of these balms- Raspberry, Mixed Berry, Cherry, Peach and Orange. I received the one is the shade Peach. It’s a pale peachy shade as the name suggests. Sadly, the shade doesn’t suit me at all. It’s way too pale for my skin tone. Texture/ Pigmentation/ Wear Time- The texture of this balms are really good. It’s not waxy or sticky and glides on smoothly. Maybelline has successfully maintained their quality of lip balms with these new ones too. I really like the formula of this new Candy Wow balms. They are claimed to be formulated with Vitamin E which protects the lips from drying. As I mentioned earlier, the one I received is in the shade peach and is decently pigmented. You can’t expect it to be as pigmented as a lipstick, even the least pigmented ones but the colour pay-off is surely a tad bit more than the other coloured lip balms, even better than Maybelline’s Electro Pop ones. Another great thing is that the balm pigments the lips uniformly from start to end. I am quite happy with the staying power. It stays for almost 3 to 3.5 hours on my lips without any heavy meals. The colour stays upto 2 to 3 hours but the hydration lasts for a longer period. Smells really nice like fruits/candies. Quite pigmented for a lip balm. Keeps lips hydrated and nourished for a decent period of time. Makes lips look visibly healthier. Survives light snacks and drinks. This particular shade does not suit me. I think this shade is good for anyone who has a fairer skin tone. It looks really pale on me. Overall, I would not say that it is an exceptional product in terms of quality but the packaging is definitely a standout. The chubby stick/crayon packaging is all over the market, trending day by day. So, I won’t be surprised if people go for them even if they have to pay more for the same quality they get in the original Baby Lips. I am impressed with the Maybelline Baby Lips Candy Wow bacause the packaging looks really cute and most importantly because they are meant to hydrate your lips for over a longer period of time and they are true to their claims. They do nourish the lips very well and make them look visibly healthier.. I really love fruity smells in my lip balms but if you don’t then you should stay away from these. You should get them if you like to switch your regular lip balms with the one with a cute, funky packaging. I would probably repurchase it again but in different shades. I would like to try Raspberry and Orange next. I hope you liked this post. If you did then please do share this post with your friends and family through your social media platforms. I will love to hear from you guys about this post. You can also add me on Snapchat to ask me questions. I can show you more swatches in different lightings on Snapchat. My username is ‘sayantinee‘. The next post will be up very soon. Till then, be happy & keep smiling! So, what do you think about the Maybelline Baby Lips Candy Wow? Disclaimer- PR sample but unbiased opinion.